Sometimes I wonder why we go camping at all. It's no cheaper, anymore, than staying at a local motel. At $4 per gallon and 10 MPG when I'm towing, we can't really afford the long excursions we'd once planned. So we end up camping less than an hour from home. We eat cheap food and drink bland coffee. Feels like we spend almost half of our vacation time hooking up, driving, then setting up camp. So why bother going camping? For moments like these. This was fall of '09. My wife was working. Me an' the boys headed out for an impromptu trip to one of our all-time favorite campgrounds, Holiday Hill near Springwater NY. We didn't have reservations and our preferred sites were already taken. After having a look at what was available, we decided to take a shady, stony campsite back in the woods. The weather was mild for August--hot in the sunshine but chilly overnight. The campground was fairly quiet, until the DJ showed up on Saturday afternoon. For some reason, none of us felt like swimming. We spent most of our time there just hangin' out together. We played Frisbee® games, listened to music, and read our books. Meals were camp-simple: hot dogs, burgers, PB&J, or cereal. We left the TV at home. I'm not even sure if we bothered to bring the laptop. Though we probably hiked a bit, we didn't join any volleyball games or spend any time fishing in the ponds. We just hung out. It was wonderful, and seeing that picture cycle-up on my laptop screen-saver brought it all back in an instant. My kids are nearly grown. One just finished his freshman year at St. John Fisher College. The younger one is becoming an excellent driver. They both have sports and friends and MP3 players and Facebook pages. But when we go camping, all of that goes by the wayside. It's just us, tossing a Frisbee and talking about stuff. We sat by the campfire that Saturday night, slightly annoyed by the music from the nearby pavilion. We listened to the breeze in the trees, heard the crickets and bullfrogs around us, and fetched jackets as the temps fell after sunset. I finished the book I'd brought with me and grabbed another from the "take one" bookshelf at the camp store. I laughed when I realized it was one I'd read before. Why do you go camping? Do you really save any money? Or is it all about something deeper? If you have any special moments from your camping trips, you can share them here. I'll be outside getting our camper ready for the new season, almost here now. Snowstorm in eastern NY, the real April Fool's joke, means you need to know all about Winter Camping! Just mention Camping, and visions of warm sunshine, idyllic summer days and quality family time instantly appear in the minds of most camping enthusiasts. Warm-weather campers may consider winter camping impossible, too dangerous or a specialized, extreme sport best left to experts resting half-way up Mount Everest in a blizzard . It is, however, reasonable and quite possible to camp in winter simply for the love of camping. Fresh air is offered by Mother Nature year round. Camping in the snow can be done quite comfortably, even when temperatures dip far below zero, if one is suitably equipped and necessary precautions are taken. Camping on wheels or not, consider these tips for comfort, fun, and safety. Let’s go winter camping ! 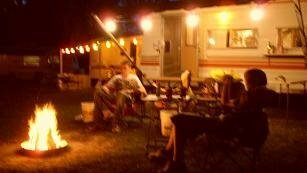 • If you normally go summer camping on wheels, ensure your camper is equipped appropriately with a heater or propane furnace. Carry an adequate supply of propane and test the furnace before heading out. Test to ensure pilot lights, regulators and ventilation systems are all in excellent operating condition. 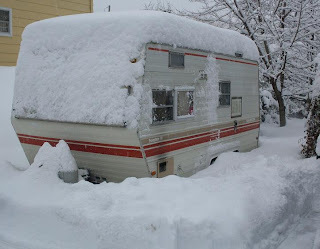 • Avoid the temptation of using that convenient camper plumbing system if sub-zero conditions are expected. Such systems are at risk in winter. Potable water and gray-water tanks can freeze quickly in severe cold, seriously damaging uninsulated pipes and even the tanks themselves. Below freezing, even the simplest drain hoses and valves can become problematic as ice gradually builds up in them. Use a dry chemical toilet for those calls to nature instead . • For tenting, double-walled or insulated tents are available. Snow is cold but it is also an insulator. Clear away snow and install a ground sheet or plastic canvas on the tent location, and bank up snow around the base of the tent. If snow conditions are suitable, you may even try building an emergency quinzy (quinzhee) or an igloo for fun. Northern peoples have lived in such structures for centuries. • Use cold-weather Arctic-rated sleeping bags with thick foam ground pads (rated R-4-6) which will be warmer than sleeping on an air mattress. • Use thermal underwear or “sweats” with hood to sleep in. Keep this clothing dry! • Wear appropriate winter clothing and bring changes of clothing. • Freeze-dried foods can be prepared quickly with a minimum of fuss on small burners, and insulated containers keep water-bottles and grocery supplies from freezing in all but the most extreme conditions. The use of paper plates eliminates the necessity of washing dishes. • Include extra candles, flashlights and spare batteries, matches and fire starters. A single candle burning provides an amazing amount of emergency heat in a tent. • To enjoy campfires, it may be necessary to bring dry wood with you. Depending on temperature and snow conditions, dry usable fire wood may not be easily collected in the wild. Don’t forget the axe and small bow saw. • Maintain your cell phone for emergencies. In extreme cold, keep the phone warm in an inside pocket. • Remember to pack a first aid kit, cameras, snowshoes, skis, and other equipment desired, including ice fishing gear and permits if planning some “hard-water fishing” in your area. • Ensure your vehicle is in top condition. Bring along a fully-charged spare battery for your vehicle, gas line antifreeze, some basic tools and jumper cables just in case. Winter camping can be challenging, but there are benefits--including cold fresh air, no biting insects, and fewer noisy boom-boxes. There is the element of personal satisfaction at having done something few people will ever experience. You may even find there are special “off-season” rates available at savvy all-season campgrounds that offer plug-ins and other conveniences. Wouldn’t that be cool? Raymond is a good friend, fellow freelance writer, and hosts Incoming Bytes with his own brand of biting insight. 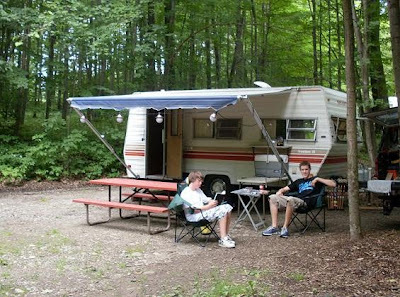 When the two of us correspond, we generally sign off with our familiar "we like camping better." This Winter Camping article is exclusive to JCO (thanks, Raymond! ); Part II will be posted later this week. Finally--we take the Class A RV plunge! After 5 years of towing our lovingly restored 19-foot 1980 Shasta trailer, we have at last made the big move to Class A! 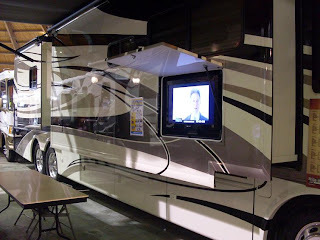 Back in January, my wife Lin and I spent a bitter winter day at the big Dome Arena RV SuperShow, wandering the displays, oohing and ahing, and taking pictures. At the time, in fact, I promised to return with pictures. I'll stop back with more of those in a later post. What we didn't tell you then, and can reveal now, is that we were deep in negotiations with a local RV sales center to purchase a new Class A Motorhome. This was no small move, and didn't happen that day. There were details to hash out and arrangements to be made. One of those involves selling our dear friend, the Shasta camper--a tearful event, to be sure. The deal is done now, friends. I can't even begin to tell you how excited we are. Actually, I don't have time to tell you much more about this tonight. We're closing the deal and taking possesion Saturday morning. Once our name's on the registration, I'll come back with more details and some pictures taken outdoors. Did you make a big camping gear move over the loooong winter? Do you think we're crazy--would you much rather go camping in a tent, instead?